YouTube has clarified that the YouTube Partner Program requires channels to have original and relevant content. Even you upload public domain movies or "fair use" video compilations, you need to "add value" to monetize that content. YouTube started a review process for YouTube Partner Program applications in 2017. Formerly there wasn't a review of a channel's content before monetization was enabled, and acceptance was usually fast and automatic. With the new reviews, a number of channels have had their application rejected - or their monetization disabled - for the ambiguously-named "Duplication", "Repetitive Content" or "Reused Content". 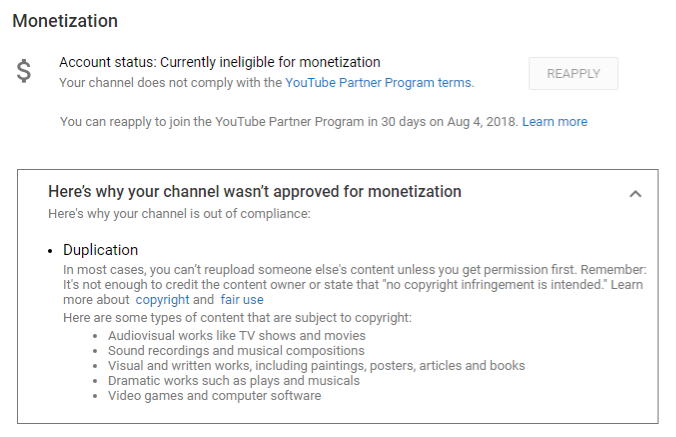 Information provided to rejected Partner Program applicants on their Monetization Settings tab focused on copyright issues, which didn't always seem to apply to the creator's channel. And while it is possible to reapply after 30 days, YouTube didn't provide any guidance about what steps could be taken to improve the likelihood an application would be approved. 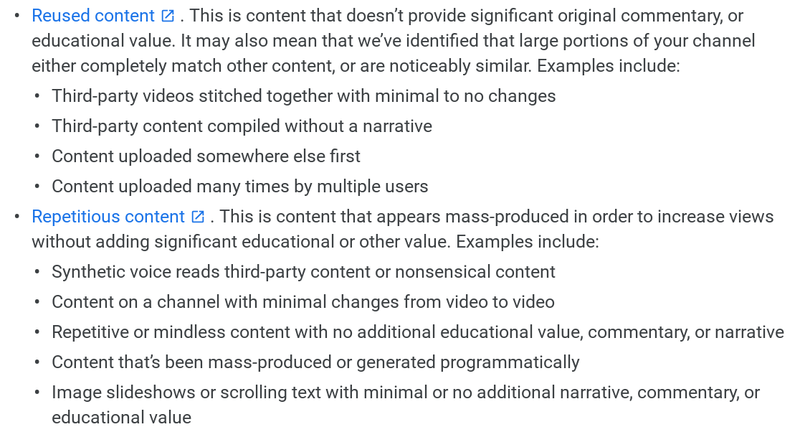 Now YouTube has finally provided more information about what "Duplication" includes, and best practices users should follow. 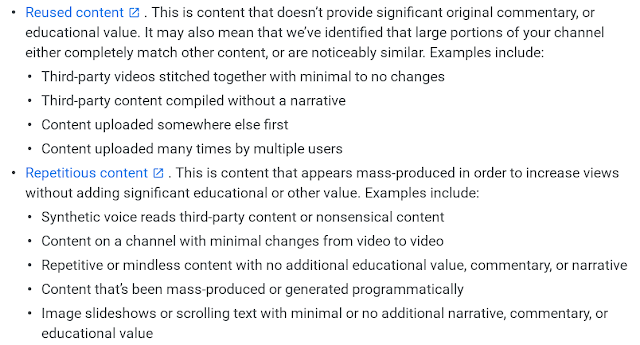 Your content is expected to comply with the YouTube Partner Program Policies, Advertiser-Friendly Content Guidelines and the AdSense Program Policies which include the AdSense Quality Guidelines. What you should do if your application for the YouTube Partner Program was rejected for "Duplication" or "Reused Content"
Make sure that you have a license or explicit written permission to use any 3rd party content commercially. YouTube provides some guidance on how to read a license to understand your rights. There is also more detailed information about using video game or software content. And no, just because there isn't a Content ID claim does not mean the copyright holder is fine with you using their work. Add commentary or otherwise show your presence in your videos. Add your personal touch, your voice or your face on screen. Provide more written context about your videos in your video and channel descriptions. You can provide license details for third party content in the video description. Do you think this applies to compilations of my own work? I certainly don’t spam my videos but occasionally I group short form videos together and make a compilation. If it's your own original work, it's probably OK but be sure to provide context in your video description explaining it's your own work, and maybe even linking to the originals.